What sets Fluidity apart from other barre workouts where the barre is mounted on the wall, is that the unit can be adjusted to individual height for ideal body alignment. Being adjustable and portable is ideal for both front & back exercises, since it is not against a wall and is easier to align your spine. In addition, the workout helps strengthen pelvic muscles to help with incontinence (a real issue for many women). The founder Michelle Austin who trained with Lotte Berk found this method to help with many health issues, as you are helping to self-correct when training in your own body alignment. The beauty benefits are endless...perfect posture, a long & lean appearance, and sculpted abs to name a few. The home unit is portable, easy to travel with , making it easy to take on any road trip or vacation. It folds up and can be easily stored. Also to help you get the most out of your barre workout, they have many studio classes rolling out around the US, including Los Angeles, New York, North Carolina, Washington DC/ VA area, Chicago, Jacksonville, Gainesville and Miami just to name a few. The studio classes are available now in Gainesville- at Gainesville Health & Fitness Center. In the fall at David Barton Gym in Miami. 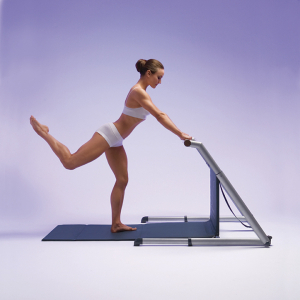 We want to give one of our lucky readers a chance to win one of these Fluidity at home barres. This giveaway runs 8/31/15 12:01am EST through 9/13/15 at 11:59pm EST, and is open to US res­i­dents 18+. Please enter using the form below. Dis­clo­sure: I was not compensated for this post. This give­away was organized by Blog­gin’ Mamas. If you have any ques­tions or would like to run your own give­away with Blog­gin’ Mamas, please email info@blogginmamas.com Sponsor responsible for prize fulfillment. The Dog Days of Summer are here! To celebrate summer, Mabel&apos;s Labels is offering 30% off on Personalized Name Stickers with the Dog Icon, today only! Shop the Dog Days of Summer sale at Mabel&apos;s Labels >> Get 30% off Dog Themed Personalized Name Stickers at Mabel&apos;s Labels, today only! Dogs can vary in size from a 36 inch (150+ lb.) Great Dane to a 2 lb. Chihuahua. Puppies have 28 teeth and normal adult dogs have 42. Dogs&apos; sense of hearing can reach four times the distance of humans. A Dog’s sense of smell is 10,000 – 100,000 times more acute as that of humans. A typical dog has the same brain aptitude level as a toddler. Dogs can comprehend about 250 words and count up to 5. From Save the Dates to Thank You cards and Invitations, Wedding Paper Divas has designs that fit YOU! These are aren't generic or boring - You can completely personalize the cards, upload your own photos, change the font, text and color to make the cards uniquely YOU. It's not too late to save on all your wedding day staples so head on over to Wedding Paper Divas now. Offer expires 9/30/2015 (11:59 P.M. PT). Save 10% off using the code 2015WED10 at checkout. There is no minimum purchase required for this promotion. Offer is not applicable to previously placed orders, shipping, taxes, rush processing charges, photo books, calendars and personalized postage stamps. This promotion code cannot be combined with other offers. Offer is only valid on Weddingpaperdivas.com and is not applicable on third party or partner websites. To prevent fraud or abuse, we reserve the right to discontinue or modify this offer or cancel any order. Mabel's Labels has something special in store for all you book worms! You can now get 30% off the Ultimate Back to School Combo with the book icon when you use promo code BOOKLOVER! >> Get 30% off the Ultimate Back to School Combo with the book icon at Mabel's Labels! Reread classics: They're well loved for a reason. #ProductReview: #NeckNapperz is a child's best friend on the road! Financial pressure is the number one reason Hispanic youth do not attend college. As a community supporter and partner of the Hispanic Scholarship Fund, Coca-Cola’s #ForTheDream program is helping provide Hispanic families with the resources needed to go to college and achieve a higher education. The For The Dream program has a sweepstakes component, #ForTheDreamSweeps, in which Coca-Cola is awarding one College Tour Experience and 34 x $500 grants to cover education expenses. Posting a selfie on Twitter or Instagram with someone who is helping you achieve your college dreams, and hashtagging it #ForTheDreamSweeps. The #ForTheDream program and #ForTheDreamSweeps starts July 1, and ends Aug. 31. For more information, please visit http://coke.com/forthedream. La presión financiera es uno de los retos más grandes que enfrentan los latinos en el momento de ir a la universidad. A través del programa #ForTheDream, Coca-Cola colabora con el Hispanic Scholarship Fund para ofrecer a las familias hispanas los recursos que tanto necesitan para ir a la universidad y obtener una educación superior. El programa #ForTheDream también galardonará un gran premio que incluye la oportunidad de participar en una visita universitaria al igual que 34 becas de 500 dólares, cada una para ayudar cubrir los gastos de educación por medio del sorteo #ForTheDreamSweeps. Usar un código de productos My Coke Rewards y participar a través del sitio web http://coke.com/forthedream. Ahora gane mas por entrar a nuestro Giveaway! Mabel's Labels Little Kid School Combo - This brand new combo features extra-durable, waterproof labels and tags designed especially for little kids going to school for the very first time. Perfect for backpacks, clothes, lunch containers, shoes, toys and more, these labels will keep all your child’s little things coming back home at the end of the day. Mabel's Labels Ultimate Back-To-School Combo - This best-selling combo includes all the durable, waterproof labels needed to keep belongings out of the lost and found. Perfect for backpacks, lunch containers, clothes, pencil cases and so much more, these labels are a must have on your back-to-school shopping list! Mabel's Labels Stylish Scholars Combo - Featuring a range of modern, refined designs, our Stylish Scholars Combo is perfect for students of all ages. Use these sophisticated labels on school supplies, water bottles, tablets, chargers or cell phone cases—and much more! Mabel's Labels is offering early bird pricing with $5 off their new Back to School Combos! These smart new labels are only available now through September 30th, so get your combo pack while they're in stock. Mabel's Labels has something special in store for all you Shark Week fans! July 5th through July 12th, you'll be able to get 30% off on Personalized Name Stickers with the Shark or Hammerhead Shark Icon. Sharks can be fussy eaters. Sometimes they will take a bite out of their prey or just sink their teeth in to get a taste before they start really feeding. If they don’t like the taste, they spit it out and move on. Like many creatures, including humans, sharks have a large heart with four separate chambers. Blue Sharks are the fastest sharks, reaching speeds of 43 mph, but only in short bursts. Their normal speed is 7 mph. Experts believe that the whale shark may be capable of living up to 150 years, making it one of the longest-living creatures on Earth. A shark’s skeleton is made of rubbery cartilage, like the tip of our noses. A shark attack on a human usually occurs in less than 6 feet 6 inches of calm water, and within a relatively short distance from shore. Swell sharks received their name from their ability to swallow water and swelling up themselves to appear larger in the eyes of predators. The hammerhead shark has the best sense of smell. Shark meat has an unpopular image as food, so fish markets and chefs change the name of shark meat to rock salmon, rock eel, huss or flake. Even though school's out, summer is a busy time for kids and parents alike. There are trips to take, activities to plan and adventures to be had! And no one wants to be pulled away from the fun because of lost or misplaced items. With a little help from Mabel's Labels, you can focus on the fun and not on the finding. Three popular summer activities that are made much more fun with Mabel's Labels include: beach trips/pool parties, camping and barbecues. Beach Trips and Pool Parties - Use Mabel's Labels custom clothing labels on everything from flip flops to sun hats so there's no confusion over which clothing items are whose! And Mabel's Labels' Bag Tags are perfect for making sure the right towels, snacks, sunblock, and sunglasses find their way back into the right beach bag. Camping - Having all camping items labeled before and during the trip will save everyone a lot of time and frustration. For example, Storage Bin Labels make it much easier to know which bin holds all the camping gear. And Mabel's Labels Pantry and Kitchen Labels make it easy to see which container holds the marshmallows and which ones hold the chocolate and graham crackers! Barbecues - There's nothing that says summer like the smell of food on a grill. Mabel's Labels Spice Jar Sticky Labels will help the grill-master know which spices are paprika and which are cayenne. Their Mini Custom Name Stickers are perfect for helping guests keep track of their drinks and Wash Away Labels are ideal for knowing which potluck dish belongs to which guest. Plus, they are microwave safe and literally wash away in the dishwasher or running water with no sticky residue. Whatever fun activities you have planned this summer, let Mabel's Labels help you keep track of all your items so you can focus more time on having fun and less time trying to keep things safe and organized. Customize your labels today atMabel's Labels! As always, remember - Mabel's Labels offers free shipping to the US on all orders!